These 440 grade Stainless Steel Bird Type Bars are the highest quality and easiest to clean and maintain due to their simple design and rugged construction. The theoretical wet film thickness is etched onto every drawdown bar. 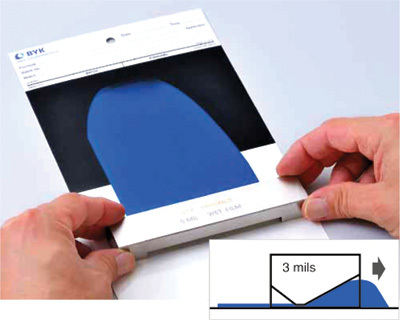 The theoretical wet film thickness is roughly one-half the actual gap clearance. If you have a gap clearance of 6 mils, the theoretical wet film thickness etched on the bar applicator is 3 mils. We cannot guarantee that you will draw-down the theoretical wet film thickness. The drawdown process consists of many variables. The actual wet film thickness can vary from 50% to 90% of the gap depending on the gap clearance. Every drawdown bar is certified in the lab and comes with a NIST traceable calibration certificate. Packaged in a handy reuseable storage box to help prevent damage. Made of 440-grade stainless steel, ground to tight tolerances for repeated use. Each Stainless Steel Bar Film Applicator comes with Reuseable Storage Case and NIST Traceable Calibration Certificate. Custom size and cut applicators available. Call for Pricing. NOTE: Drawdown bars can only be returned unused and in original packaging.